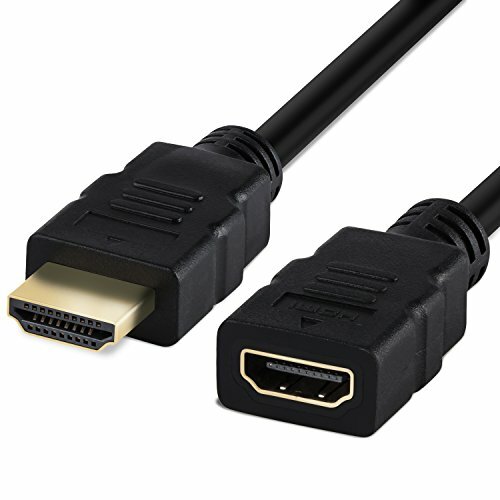 Fosmon's HDMI Male to HDMI Female High Speed Extension Cable with Ethernet is perfect for extending an HDMI connection or connecting a device with HDMI connectors. HDMI is the most popular standard for connecting devices to HD displays and HD audio devices. Connect your HDMI cable, Google Chromecast, Amazon Fire Stick, Roku Stick, Intel Compute Stick, Microsoft Wireless Display Adapter, or any HDMI male device to this extension cable, while connecting the other end to a TV, monitor, display, and more. 4K (2160p) currently provides the sharpest clarity and provides a significant boost over 1080p. 4 times the pixel density means sharper, clearer, and more vibrant images and videos. 60Hz refresh rate is supported for the smoothest picture when paired with 4K. This cable supports the latest HDMI specifications and their features, such as 3D, CEC, ARC, Deep Color, Dolby TrueHD bitstream capability, DTS-HD Master Audio bitstream capability, and more-provided that both the input and output devices support the respective feature. Gold-plated connectors help resist corrosion and reduce tarnish for full transmission quality.